Training a Yorkie to be accommodated in a house is considered to be a demanding task to deal with. The new puppy-owners are often given the wrong impression that house training a dog of Yorkie breed is a colossal matter. However, house training a Yorkie is a rather very easy and interesting task if the perspective will be changed to taking care of your little cute friend, instead of training a pet animal. These tips to house tame a Yorkie, that you have just bought; it is obvious that you need to adopt the right methodology and line of action. If you are of the view that your newly bought Yorkie has an instinct not to pee and poop in the areas where it sleeps and lives, then you are totally wrong. You have to teach and tame the puppy to use its toilet. Today, we will share with you a few effective and significant tips for house training your Yorkie. 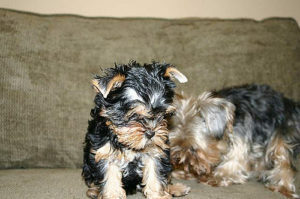 Every Yorkie or Yorkie puppy has some limitations to hold its basic needs depending on its age. The most significant matter for a puppy owner is to understand the timing for pee and poop and it will be quite rude to let the puppy wait for a whole day to get it out for the toilet. Hence, it is highly advisable to know the duration of time the Yorkie can hold to its basic need of discharge. A 1 or 2 months puppy can wait for up to 2 hours, puppy of 3 months can hold for 3 hours, an older puppy of about 6 months can hold for 5-6 hours. An adult dog of 1 year can wait up for about 8 hours. However, letting such an innocent creature to hold on to its need for up to 8 hours is rather torturous. Knowing the perfect time for initiating house training of Yorkie is the key to the efficient and successful training of your dog. In the experts’ view, the earlier you start training your Yorkie, the better results you will get. However, it is equally important to understand that a small puppy, new to your home must be stressed and upset in the beginning. It will need some time to get used to your house. So, wait for a few days to let your puppy adapt to the new surroundings and then start your house training plan. The Freedom Method is considered as one of the best methods of housebreaking for a Yorkie and other small dog breeds. It allows you and your dog to walk and play freely around the home area. However, to monitor puppy’s activities, you can attach a string from Yorkie’s collar to your belt. The pen and gate method allows the owner to confine a certain area for the puppy when the owner is not at home. That can be a small gated off area or portable Yorkie pen. The Experts have also suggested not adopting crate (wooden box) accommodation for your puppy. There will be no benefit in keeping your puppy in such a small area. Like human beings, your puppy also needs to be prepared for bedtime, which means that it must be given dinner, 2 hours before sleep time. Take Yorkie for a walk or to the potty area a half hour before the bedtime for proper sleep. Hope you have the basic tips to house train your Yorkie, but in a case of any serious observation, do not forget to take it to a veterinarian. All the Best!